Each coin contains 1 troy ounce of 999 fine investment grade silver bullion. The South African Krugerrand coin was launched in the 1970s and was immediately very popular. 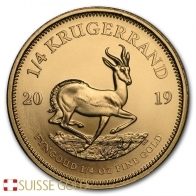 In fact the 1 Ounce gold Krugerrand coin was the most popular gold coin available to retail precious metals investors until around 1980, when Apartheid made the Krguerrand more difficult to source in Europe and America. As a result, the Maple Leaf became the most popular coin at that stage. 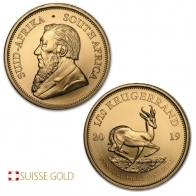 The Krugerrand was released in silver as a proof coin in 2017, and as a silver coin available to silver investors in large quantities in 2018. The 1 Oz silver Krugerrand is a competitor to the silver Maple Leaf coin, as the two have a similar premium over spot, and are relatively low margin silver coins. The 1 Oz Silver Krugerrand is available as an individual silver coin or as a monster box of 500 pieces. The front of each coin features an image of Paul Kruger, South Africa's first president. The reverse features an image of a Springbok in a field. The year of minting and coin weight can be found surrounding the image. The silver Krugerrand coin is produced by the Rand Refinery in South Africa. Please contact us to sell silver Krugerrands. View today's silver spot price per oz. Price includes vault storage for up to one year.